For the Seaside National Bank in Sarasota, the existing space was straight out of the 1980s. The commercial design concept “Tommy Bahama Style” was selected to create an elegant coastal feel in an existing downtown space. The existing space had many columns, oddly placed dropped soffits for mechanical, high ceilings is some spaces and a skylight corner tower entry. Susan Berry created column details with espresso stained wood trim, woven raffia inset panels and tall wrought iron and tobacco leaf glass globes to help bring the eye down. The existing raised ceiling area was squared off and finished with bamboo plank flooring with contrasting beams. The large colorful sea life mural and the tobacco leaf glass dome light fixtures fill in the volume. The existing soffit over the teller desk was shaped into an alcove barrel vault. Split random colored bamboo covers the back wall. The teller desk is designed with an inset panel of basket weave pattern honey, black and white onyx mosaic tiles. Mixing textural materials adds to the rich airy feeling. 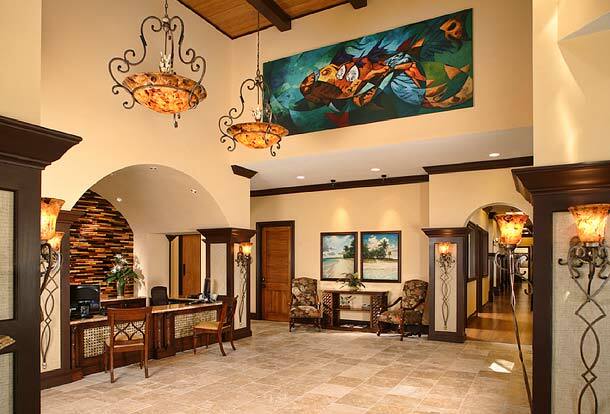 Furnishings, art, and architectural construction documents were provided by other team members. The existing corner glass tower was brought down to scale by finishing off the octagonal shape with espresso colored rough timber beams that connect the two existing raised ceiling spaces. Four large tobacco glass pendants drop from the glass tower to bring the eye down. 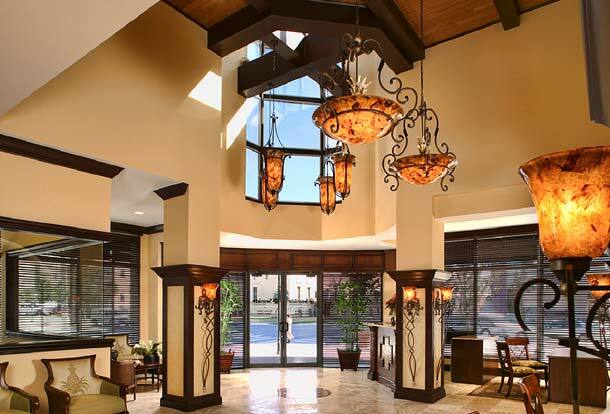 There is a small concierge desk with custom woodwork to the right of the entry. All of the offices are glass faced to bring the natural daylight to the core of the building. 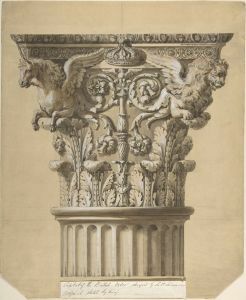 Notice how our column trim detail on the existing entry columns works to bring the scale to a comfortable level. One of the main reasons for hiring a professional designer for an existing awkward space is the designer’s knowledge in using color, texture, scale and details to create visually comfortable spaces. All of the design elements go beyond “theme or decorating” to create psychological comfort. The community conference room was located in an interior space along a party wall. In order to maintain privacy, while bringing in natural light and a more open feeling, small glass filled window openings were designed to fit pre-made wrought iron grills. The natural wood doors are a contrasting stain color from the dark espresso stained wood. The wainscot is the same raffia wall covering as the column insets. 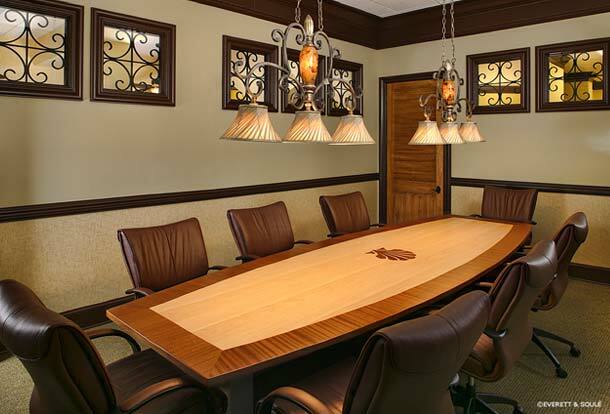 The conference table has a “surfboard” shape with contrasting bamboo veneers and Seaside logo inlay. Simple well thought out details make all of the difference in creating a feeling of casual luxury. Susan Berry provides consulting for commercial design concepts. She does not practice commercial architecture. Classical Home Design, Inc. often creates interior theme concepts for business owners, interior designers and state licensed architects for them to incorporate into their construction documents. Please contact us to discuss your design project. Seaside National Banks themes the design of each individual branch to reflect the architectural style of each cities location. CHDI has created themed details for several locations for commercial builder Castleworks, Inc. and their team of architects and designers. All photos are courtesy of the builder, Scott Green of Castleworks. Many of our clients work with architectural firms who are brilliant with construction documents, but they do not have a full-time designer on staff with historical styles or theme environment experience. That’s where we come in.